Do you usually bypass the herb section of the produce aisle? These recipes will make them a staple on your grocery list. Using fresh herbs is one of the easiest (and cheapest) ways to take a dish from basic to brilliant. But for the home cook, incorporating fresh herbs can be daunting and probably raises some questions. What do they taste like, when should you add them in the cooking process and what flavors go well together? With this guide to ten common fresh herbs (and a little help from our chef experts), you’ll no longer walk right past the fresh herb stand at your local farmers market. Although parsley looks strikingly similar to cilantro, the taste is much milder. “Parsley has a fresh taste that’s earthy and mildly sweet,” according to Sara Haas, RDN, Chicago-based and author of Taco! Taco! Taco!. Parsley and cilantro look extremely similar, so make sure you opt for the herb with the pointy leaves. One cup of chopped parsley provides over one thousand percent of your daily value of vitamin K, plus it’s rich in myricetin, a flavonoid that may have some anti-cancer properties. Haas suggests using parsley at the end of cooking for finishing dishes. 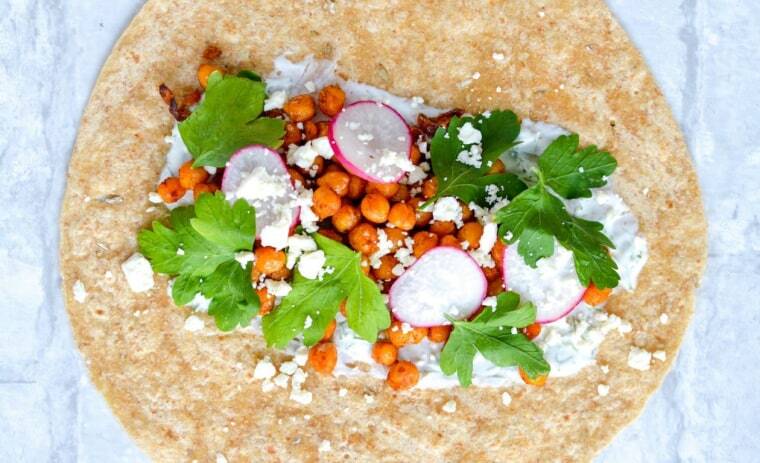 “It’s great in tabbouleh, roasted potatoes, pasta dishes and grain dishes,” and it makes a nice accompaniment to salads and sandwiches, like this Spiced Chickpea Wrap. “Tarragon has a bright, peppery, yet sweet anise-like taste,” says Jackie Newgent, RDN, culinary nutritionist, author of "The All-Natural Diabetes Cookbook" and spokesperson for American Pecan Council. “Frankly, I think it’s one of the most underutilized fresh herbs,” she adds. Tarragon contains magnesium, iron and zinc, but the amount used in cooking is usually rather negligible. Newgent advises adding tarragon at the end of the cooking process or making use of the fresh leaves. “One of my favorite recipes to serve at picnics is a tarragon chicken salad with pecans, since tarragon is a perfect pairing for chicken and the pecans provide delicious texture and filling dietary fiber to the creamy salad.” For a dinner recipe, try this Mushroom and White Bean Pasta, finished with tarragon. Arguably the most popular fresh herb (probably because it’s a pizza topper), basil has a sweet, aromatic and somewhat peppery flavor. Like the other fresh herbs, it’s rich in plant polyphenols that are thought to prevent chronic diseases. Not surprisingly, basil pairs well with Mediterranean flavors and works best when added at the end of cooking. It’s also a nice accompaniment to fresh salads, such as this Spring Strawberry Salad. According to Haas, thyme has a minty, earthy, lemony flavor with a hint of pine. It is believed that the oil of thyme may have antimicrobial properties, and thyme itself is a good source of vitamin C. “Thyme is great for adding flavor to soups, stocks and stews, roasted veggies, as well as cooking beans from scratch,” says Haas. It’s often used at the end of recipes, such as this Sautéed Mushrooms with Thyme and Bulgur. I always get thyme and rosemary confused, probably because the taste is rather similar. Rosemary can also be described as lemony with a hint of pine, but it has a more woody taste than thyme. The distinguishing difference is that rosemary looks like a branch from a pine tree. It’s a good source of iron, calcium and vitamin B6, and “research has shown that rosemary may deter the formation of carcinogenic compounds during grilling,” says Haas. It’s best to use rosemary during cooking or for marinades, and the sprigs can be used as skewers, like in this rosemary shrimp recipe. Cilantro is quite divisive, since people either love it or hate it. “Cilantro tastes a bit citrusy and pungent; though, some think it has an unusual soapiness,” says Newgent. “Cilantro is actually the Spanish translation for the leaves of the coriander plant,” she adds. Newgent also recommends using cilantro in cold prep, but not during cooking. “It pairs with Mexican, Asian and Indian dishes, like this Coconut Cauliflower ‘Couscous’," remarks Newgent. One of the most underrated fresh herbs, dill is actually used more often than you may realize — dill pickles or tzatziki sauce anyone? Dill tastes both sweet and sour, and it has a hint of citrus. It’s a good source of calcium and iron, and the flavor pairs well with virtually any dish. Try using it on salads, baked potatoes or in savory baked goods, like these Hard-Boiled Egg Cheddar Muffins. “Oregano tastes like Italy, if the country had a taste!” says Newgent. “In other words, it’s kind of pungent, woodsy, and bold with a sweet spiciness.” You’ve probably doused your pizza with dried oregano, but using the fresh stuff is far more rare. It’s often too pungent to eat raw, so fresh oregano is best when used in the last 15 minutes of cooking, according to Newgent. Fresh oregano makes a great accompaniment to a pot of beans, a lemony marinade or a simple marinara sauce. Everyone knows what mint tastes like because of, well, toothpaste. But fresh mint has a stronger, sweeter and earthier taste. Mint has long been revered for its ability to treat stomach woes, and research has even linked it to treating Irritable Bowel Syndrome (IBS). Mint is often used in Middle Easter dishes and teas, but it also makes a great addition to a green smoothie.